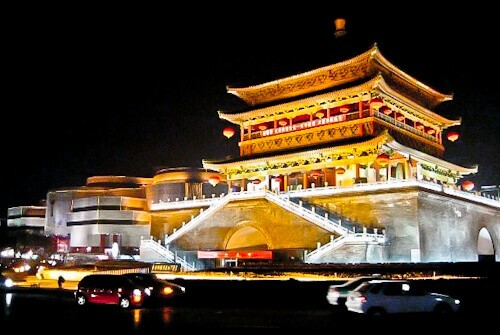 Xi’an is a large city, I’d recommend staying in the center of the city, close to the Bell Tower. Xi’an is a beautiful city, the Bell Tower (above) you would think is a unique building in the city but there are many buildings in the city made in this style. You’ll find the local McDonald’s and Starbucks are located in structures similar to the Bell Tower. With its city walls, Xi’an reminded me of my university city in England, Chester, it’s a Chinese version of Chester! Nearby the Bell Tower (above) other important sites to see in the city are the Giant Wild Goose Pagoda, Daci’en Temple, Ketang, The Drum Tower and Xuanzang. You can easily walk to all these sites from the Bell Tower. The main reason people come to Xi’an is not to see the city or the city walls but to visit the Mausoleum of the First Qin Emperor and the Terracotta Army. Check in hotels for tours in English to see the UNESCO site of the Mausoleum and Terracotta Army, it’s normally a day trip as it’s outside the city. The Terracotta army was created by the first emperor of China, Qin Shi Huang. He started his huge toy collection in 246 BC which makes the collection over 2250 years old. 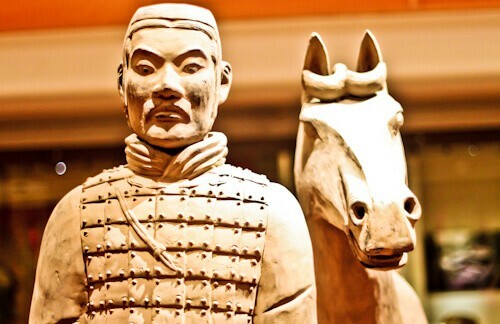 The Terracotta Soldiers are often transported around the world to famous museums to promote the famous art. If you can’t make it to Xi’an or China then chances are you can see a few Terracotta Soldiers in your country. There are lot’s of Terracotta Warrior replicas around the world, you can find this one in The Royal Armouries Museum in Leeds, UK (above). The Terracotta Warriors were all originally painted but unfortunately the paint did not pass the test of time. In Leeds they are planning on painting their replica to resemble a warrior in the original colors. In the movie, The Mummy 3, the Terracotta Army famously come to life. Adjacent to the Mausoleum of the First Qin Emperor is the Lishan National Forest Park. I would recommend combining this with your trip to see the Terracotta Army. The Huaqing Pool and Hot Springs are also close by to the forest, although you can’t bath in them, they photograph beautifully. The Lishan Forest Park itself has many historical monuments dating back to the Imperial Dynasties. You can do a little hiking as well in the park, it’s worth visiting if you are in Xi’an a few days. The train from Xi’an to Kunming in the south of China is an overnight train (36 hours). In Xi’an it’s easiest to buy your train ticket in a hotel for a small service fee. This will save you traveling to the train station to buy your ticket which is difficult with the language barrier, it’s much easier to speak English with someone in a hotel close by who’ll have the ticket delivered to you. One cultural difference you’ll notice about the Chinese is that they are excessively clearing their throats and spitting into bags, you’ll have to get used to this on the long journey south! I have always wanted to travel to China and see the Terracotta army, it is one part of the world I have yet to explore in detail more. Thanks for the tip to about staying near the bell tower, it is those type of tips I like. I’ve never been to this part of China but it looks really interesting. The Terracotta Warriors are so fascinating. 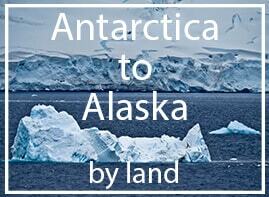 Great tips on how to get around and where to stay! I have seen many pictures of the terra cotta warriors, but didn’t know much about them until now. They really are captivating. People spitting in public drives me nuts, but such are cultural differences – at least it’s not on the sidewalk. The terracotta army is one of those under-rated gems of China that I wish more people knew about! Xian is a really unique city…definitely better than Beijing! I’d love to see the terracotta army for myself. It seems as though it could be very moving. The Bell Tower looks lovely too – would definitely like to stay near there! The fact that you refer to the terracotta warriors as toys makes me laugh! Love this and your pictures are stunning as usual! Oh I’ve never been to China and would love to see the Terracotta Army. I love the idea that Starbucks is in a building similar to the bell tower. 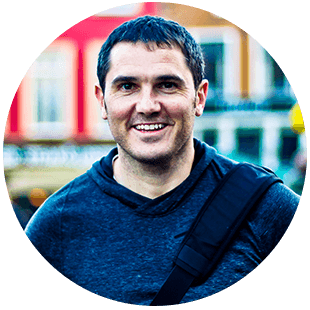 Good tips on staying in the centre of the city. Makes life so much easier. 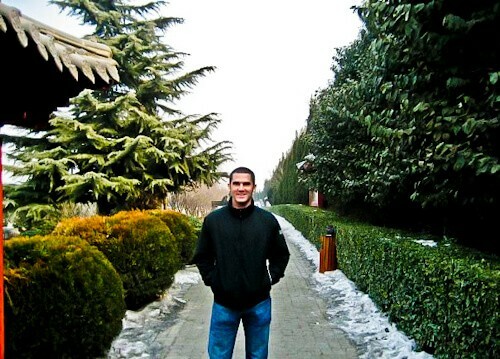 I loved visiting China, but am still bummed I didn’t get to the Terracotta Army! I’ll definitely plan another trip back to catch that and the Zhangjiajie Forest. About the train tickets, definitely buy them in advance! We hired a company to go purchase the tickets for us before we even arrived in China so that we wouldn’t have to worry about it. Saved us so much time and stress! I’ve never been to China, but it is one of my dream destinations. Would love to visit Xi an now, it looks like an amazing city. Thank you for the photos and for sharing this information! Bell Tower of Xi’an, China looks amazing part of Xi’an. As you have said all food joints like Mac, Starbucks are closeby I would preferably stay near this Bell Tower. Lishan National Forest Park also looks interesting due to Hot springs are close by. My friend lived in Xi-an for a while and I have wanted to go ever since! The bell tower looks beautiful. Wanted to see the terracotta army for quite a while now! I didn’t make it to Xi’an when I lived in China, but it’s on my list! I really want to see the terracotta army and the bell tower looks beautiful. I would love to go to Xi’an mainly because of the famous Terracotta Army, it’s absolutely remarkable to think how many of them were create and how unique each one was. Hard to imagine unless I am able to actually see it in person. I’ve never had a burning desire to go to China but my parents-in-laws recently returned and it sounded fascinating. Interesting about the clearing of throats and spitting in bags- thanks for the heads up about that! Xi’an seems like an interesting destination. I had no knowledge of the city prior to your post. 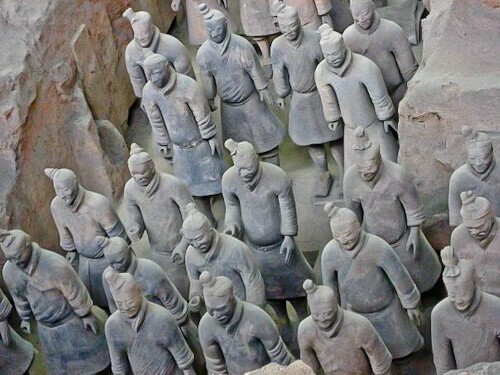 The Terracota army attraction would really be something I would love to visit. Thanks again for a great post! China seems to be really a wonderful country, in-spite of its high population the country has really maintained very well in terms of management, services, technology, tourism, hospitality etc. I had been for a business meet 6 months back really loved the city but missed to visit these places. Hope next time can plan in advance.